IDF confirms first mortar attack since truce; Hamas denies responsibility, says it's dedicated to the ceasefire. Residents of the Eshkol Regional Council reported Tuesday night that a rocket was fired from Gaza, falling outside of one of the local communities. The IDF in the last few minutes confirmed that a mortar shell fired from Gaza and landed on the Israeli side of the security fence, in the first such attack by Gaza terrorists since the ceasefire went into effect on August 26. There have been mixed reports on the precise nature of the projectile fired, with Channel 10 saying the attack was a mortar shell as opposed to a rocket; likewise, IDF spokesperson Lt. Col. Peter Lerner labeled it a mortar shell on the IDF's official Twitter feed. 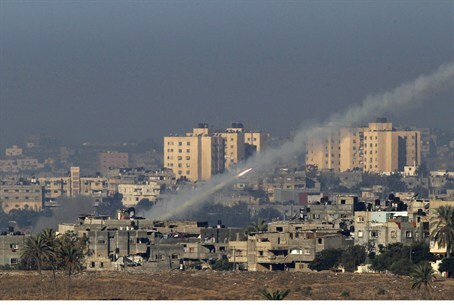 However, nearly all other major Israeli media sources have identified it as a rocket attack. No "color red" warning siren was sounded prior to the rocket which was fired around 6:30 p.m., and which caused no damage or injuries. The Hamas terrorist organization claimed Tuesday night that it had nothing to do with the rocket attack, saying it remains committed to the ceasefire. Hamas breached numerous ceasefires during Operation Protective Edge, as well as over the course of recent years. "The Palestinian factions are committed to the truce," spokesman Sami Abu Zuhri said. "We want it to continue." MK Danny Danon (Likud) spoke out after the attack, saying "we must not compromise with terror, we should have subdued Hamas during Operation Protective Edge because terror doesn't change its face." "Now we must respond with strength in response to the fire for the sake of deterrence and for the sake of the faith residents of the south gave to the leadership which said there will be quiet for a long time," stated Danon. The former deputy defense minister, who has been critical of Prime Minister Binyamin Netanyahu over his management of the operation, added "only 21 days have past and we're returning to the trickle of terror from the Gaza Belt. Self-restraint now signals acceptance of the situation." Eshkol Regional Council head Chaim Yelin also responded to the attack, saying "it's not clear if this is a strike due to internal drills or targeted fire on communities." "We won't accept sporadic fire on our communities," declared Yelin. "The leadership of the state of Israel will be measured by the way it chooses to defend its residents. We expect the government to act to bring quiet to the region." The missile comes after Defense Minister Moshe Ya'alon said just earlier on Tuesday that he didn't think Hamas would renew its terror war on Israel by September 25 as threatened if its exorbitant demands, including the construction of a Gaza sea and airport as well as the release of hundreds of terrorists, are not met. "There's no sign that someone is intending to renew fire," claimed Ya'alon. "Some sort of deterrence was established here, they paid a very heavy price. On the other hand, a point of light was opened for them," noting Israeli concessions extended to Hamas in the ceasefire. The rocket also comes the same day that Israel reached an agreement with the UN and the Palestinian Authority (PA) to renew the entry of construction materials to Gaza under a mechanism preventing them from falling in terrorist hands. Hamas has in the past taken such materials to develop a vast network of terrorist tunnels to attack Israel; reports have revealed that reconstruction on the terror tunnels has already begun.